It's like a blatant buy-out of the European internet by American megacorporations. A blow to freedom of the press. Idiotic - how is it to be enforced? What if I type some original composition and forget to correctly cite a source for some clause in my writing? What if by sheer coincidence my opinion happens to bear a match to that of another person? How accurate are these "algorithim" checks in that regard? Can these filtering mechanisms also not be used to delete anything "controversial" with no recourse to appeal by sincere posters and web site managers? Threatens to basically defeat the purpose of the internet, which is to spread ideas and encourage discourse on the problems of the day. That is what I come up with for starters. I suspect further thought would result in further objections. Copyright is also damaging to the transmission of culture. I find myself sometimes looking for a movie clip on the internet to make a point, only to find it had been scrubbed due to copyright violation. So, I can only desceibe it in words. On another point, the U.S. needs a public, high-speed wireless internet. As I recall, some cities have tried to produce them, but get attacked by major service providers. One of the times I was in England, Bristol had such a service; and then I think they had removed it the next time I visited -- but maybe I didn't look hard enough. I forget whether London ever had such a service. I had visited London several times, but don't remember checking. Nor do I remember for the other cities I've visited in the rest of Europe. as an online content creator who tries to keep up with the ins and out of my chosen field I can tell you that copyright violations are ripe for abuse. There is a recent example of I think it's Vox media who published a video about building a computer that would pretty much assure you would fry all the components. and some other youtubers provided warnings and correction to the content in the form of original videos with clips of the Vox video in question. Vox struck out with copyright strikes in a situation that is undeniably fair use. Meanwhile Vox reports on internet and celebrity culture by using images and video and audio clips gathered online without getting permission of the subjects or the original source of the media they use. Meanwhile some youtubers have been copyright struck for their own voice (in some cases because somebody used a clip or interview of them saying something and then the creator makes a similar comment in their own channel, and they get hit for duplicating. In general just youtube search copyright strike and look long and hard at the future of the internet. welcome to laws made by people that have no understanding what they are doing, but are well informed about what to do by the companies that fund the campaign financing that gets them into office. Will the legislation in question be a blow to freedom of the press? Is it idiotic? (WIth further questions as stated in the post from which I extracted the quoted comments). Will it defeat the basic purpose of the internet? It is not that I am totally opposed to the idea of intellectual property rights. It is just that I have concerns along the lines expressed by kjagaard in the above post. I don't have a clear enough understanding of the legislation or the algorithm based technology in question to come to firm conclusions. I do have concerns, especially as these European laws might come to be emulated in the United States. I also wonder, how does this potentially affect out of country postings that happen to be transmitted via the internet? Would the laws give corporations undue legal recourse through international courts to extend the mischief caused by these laws? (Laughing) Oh my god, it's even worse than anyone could have imagined! Despite ringing denunciations from small EU tech businesses, giant EU entertainment companies, artists' groups, technical experts, and human rights experts, and the largest body of concerned citizens in EU history, the EU has concluded its "trilogues" on the new Copyright Directive, striking a deal that—amazingly—is worse than any in the Directive's sordid history. Article 11, which allows news sites to decide who can link to their stories and charge for permission to do so, has also been worsened. The final text clarifies that any link that contains more than "single words or very short extracts" from a news story must be licensed, with no exceptions for noncommercial users, nonprofit projects, or even personal websites with ads or other income sources, no matter how small. Absolutely horrific. This would literally kill vast swathes of the Internet. I can't believe this will pass, it's simply absurd. Well that's socialism for you. The internet is very censored in places like China and North Korea. 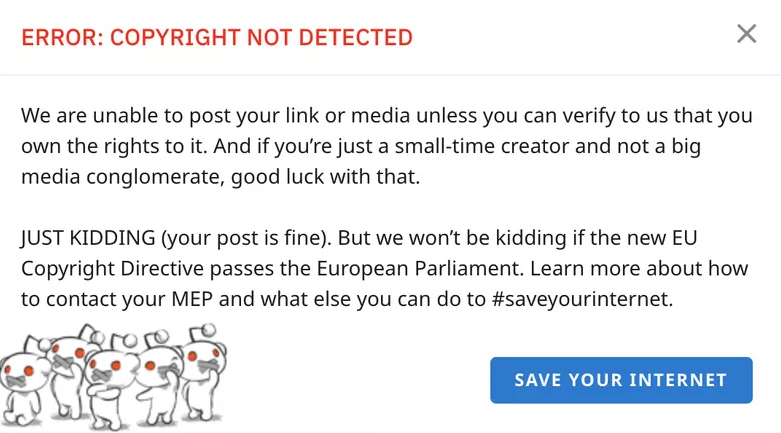 Aren't you glad Britain is exiting the socialist EU so they will no longer be required to censor everything? Not that the UK has any free speech anyway. You may or may not be trolling, but to clarify for anyone who genuinely agrees with this sentiment, the bill is being pushed by corporations and capitalism. Under socialism, copyright laws would be much weaker or eradicated all together. I'd gut copy right for digital "data" as the entire idea of copy right was made for things you can hold in your hand. Imagine the fascism that can be brought down on the people if we do not. I believe you do have a point. The rich want to control everything and statist capitalist which are fascist will do exactly that. I believe you have a point as pure communism is kind of like liberterianism as it does away with government and puts everything in the public domain. That would mean anybody could copy and paste the entire FutureTimeline website into a new domain and make profit from that copy. No thanks. Websites and businesses across Europe today are protesting controversial changes to online copyright being introduced by the European Union. Ahead of a final vote on the legislation next Tuesday, March 26th, a number of European Wikipedia sites are going dark for the day, blocking all access and directing users to contact their local EU representative to protest the laws. while staying at a 'hostel' in Oahu, I chatted with an Austrian girl and ask about her thoughts about the impending implosion of european internet because of this... she had never even heard about this. WTF? How secret is all this going down? is this one of those things we know about because we live within the spheres that are highly impacted by this to a degree that we see it as wide open? while the vast majority of others are completely unaware of it? European politicians have voted to pass Article 13 and Article 11 as part of sweeping changes to regulation around online copyright. The European Parliament passed the legislation by 348 votes to 274. Opponents had hoped for last-minute amendments to be made to the legislation, but failed to garner enough votes. Julia Reda, a German MEP representing the Pirate Party who opposes the copyright directive, said it was a “dark day for internet freedom”. Margrethe Vestager, European Commissioner for Competition, said the result was “great news”. A vote on debating amendments – including an amendment to remove Article 13 and the Article 11 ‘link tax’ from the broader copyright legislation – was rejected by just five votes. EU member states now have two years to pass their own laws that put the Copyright Directive into effect. Rapporteur Axel Voss, a member of the Christian Democratic Union of Germany, said the directive was “an important step towards correcting a situation which has allowed a few companies to earn huge sums of money without properly remunerating the thousands of creatives and journalists whose work they depend on”. If Brexit weren't being done for the sake of disaster capitalists to fatten their coffers, I'd say "Thank god the UK is leaving this corporate mess." my instinct in this case would to be troll the law all the way. A news channel has a street interview where they have a sign of a business in the shot? get it flagged for violating the law. Government reference a research study in discussion? flag them for not providing proof of permission to use the study from those that conducted it and the brands and companies referred to in it. Flag Flag Flag. Bring everything to a screetching halt in the first week of the law with all the internet trolls and activists. Make them have no choice but to roll it back. Well here's the EU's press release. It seems they toned down the most controversial aspects. "Uploading protected works for quotation, criticism, review, caricature, parody or pastiche has been protected even more than it was before."